First impression is given only once! From ultra short to medium run casemaking and binding! With Fastbind solutions you can make standard or personalized hard and soft cover books, strip binding, pads and even ring binders economically and easily. Whether you need to create simple paper-backs or luxury presentations; with Fastbind your possibilities are unlimited! Make sure your documents reflect the quality of your work and use Fastbind to produce professional, reliable and elegant bindings! 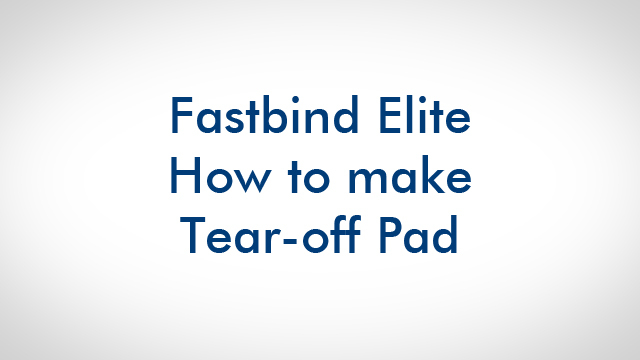 With Fastbind Elite, you do not require a cover to bind your papers together. Just reuse the silicon protective sheet from an adhesive paper and use it as you would the cover. After binding, you can easily remove it from the spine. You can reuse the same silicon paper again and again to avoid waste. Recycling the back of used paper for a draft tear-off block!